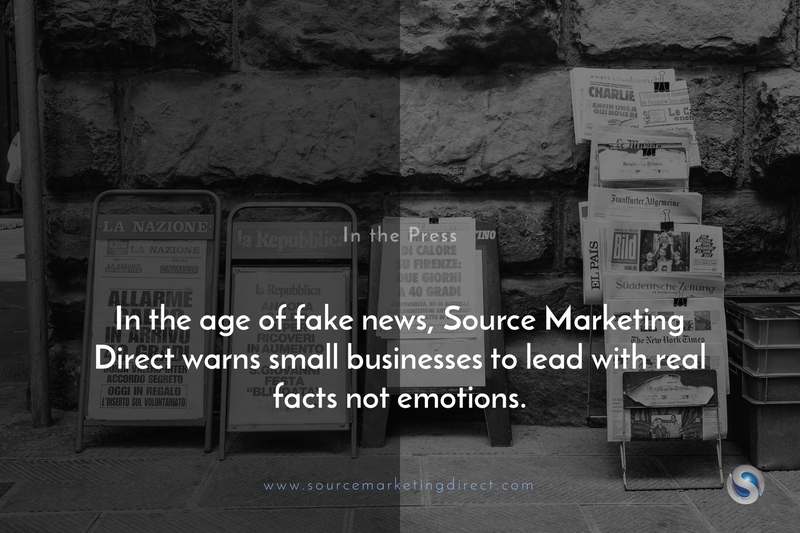 In the age of fake news, Source Marketing Direct warns small businesses to lead with real facts not emotions. London’s award-winning sales and marketing firm Source Marketing Direct are urging small businesses to use factual data to support their growth goals, not emotion or false dawns, as they observe the prominence of fake news across all aspects of today’s society. The term ‘fake news’ was not something many people used two years ago, but now it’s viewed as one of the greatest threats to digital democracy, free debate and the Western order. Source Marketing Direct are urging small business owners to prevent fake news from creeping into their organisations, and ensure they uncover the truth in their own firms, so that they can base important decisions on facts not emotions. “The importance of reporting cannot be exaggerated – it kills any room for untruths to creep in and gives the hierarchy a great snapshot of how everyone’s performing in relation to the firm’s growth goals. We use mind maps with the aim of making our collective strengths and weaknesses clear as day,” states Hector Montalvo, Managing Director of Source Marketing Direct. Montalvo believes this should especially be the case for young business owners, who must ‘collect feedback and tweak as they go’. This is because he believes the small wins along an entrepreneurial journey will help build momentum into big ones. Fake news – intentional or otherwise – can harm businesses, and cause workers at all levels to take their eyes ‘of the ball’. While much of the focus on fake news has focused on politics, a BuzzFeed report suggests that small businesses and entrepreneurs are also in the crosshairs. Source Marketing Direct believe this to be a significant finding, as larger corporate giants may be able to navigate a fake news storm easier with all their resources, in contrast to say a small-medium sized enterprise – who would likely be hit harder. “The only news you should be listening to when it comes to your business is your true profit, your cash flow, your levels of client satisfaction, and your backlog. Be wary of all the chatter floating around, it might just hurt your business,” concludes Montalvo. One big example of fake news the firm refers to regularly is the idea that people are born entrepreneurs. The firm believe it takes all kinds of people to fly the flag for entrepreneurship, and naysayers attempting to discourage should be ignored. Previous Previous post: Don’t let empowerment in the workplace fall through the cracks, warns Source Marketing Direct. Next Next post: Source Marketing Direct set date for anniversary party celebrating 10 years in business.